Welcome Anna María Larsson — Photowall's new DIY blogger! Hi Anna María! We are so happy that you’ve started blogging with us here at Photowall. How does it feel? It feels very exciting and fun! 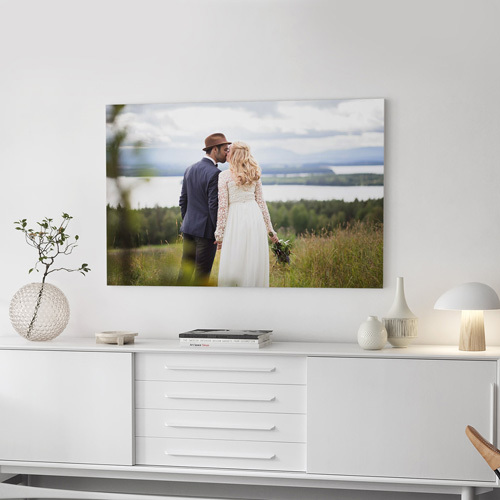 I’ve had an eye on Photowall for a little while and thought you had lots of exciting products that I really enjoyed. I’m looking forward to getting more familiar with your products and also working on things myself! I think it’s going to be great! For those who might not know you, can you tell us a bit about yourself? My name is Anna María Larsson and I work primarily as a creator. For as long as I can remember, I’ve always been quite deft and have built my own stuff and created things with my hands. I love finding new uses for things that already exist — sometimes I like to pretend I’m MacGyver. I am a trained Digital Art Director and have worked in advertising and design agencies as a graphic artist, designer, and art director. In 2017 I came in second place in Superskaparna (Super Creators), a competition for do-it-yourself and home improvement projects. I hold workshops for both adults and children and have been a DIY editor in several different magazines. You can occasionally spot me on TV, most recently on Dessertmästarnas Jul (Dessert Masters Christmas). I also have a blog, an Instagram and a YouTube channel.What are you working on now and what do you hope you can offer with your blog?I enjoy writing articles and creating DIYs that hopefully inspire more people to take up their own creative projects. I intend to take a close look at the trends in this coming year, do some of my own tests on the various products available, and come up with some exciting DIY projects that you can easily follow along with and do yourself. It’s fun to be able to change something yourself with few means and see how something completely new comes out of it. Aside from that, I enjoy creating things with my hands. It has a soothing effect on the body and can really reduce stress.How did you come to start blogging? And what is your favourite thing about it?I have been blogging for many years. It started out as a diary form when I moved to Piteå to study. It was around 2014 when I started posting my DIY projects with some regularity and sharing the things I was creating. It was partly to collect everything I made into one place, but I also began to notice that people were really taking an interest in my projects and wanted to know how I had done it.After that, the blog became a channel where I could share a little bit of everything from my life — but usually centred around creation and the things I was making. Since then, the blog has partly been a diary where my audience can accompany me during my days. It’s a wonderful collection of the many great and beautiful memories of all the things I have done, seen and experienced. It feels nice to have so many nice memories gathered all in one place.What is your most memorable DIY project?All of DIY projects I did as part of Superskaparna. To make things while under such intense time pressure, with five cameras constantly around me, all as I strove to be creative and to make nice pieces. It was a real challenge! I am still incredibly pleased that I managed to make everything that I did, from a great chandelier to a lamp made from of old toy cars. I also concocted a necklace made from PET bottles, a doghouse, a headboard for a bed, a folding wall, and I even transformed a bureau from a flea into a vibrant piece full of fabric and colour. There was also a necklace of rope, table settings for a party, and honestly much much more. I'll never forget that experience. It was a fun and absurdly difficult challenge! It’s hard to imagine anything could top the lush tropic patterns and archetypal seventies swatches that took the design world by storm in 2016. But since leading colour experts Pantone announced ‘Greenery’ as Colour of the Year 2017, we’re expecting even stronger vibrancy in this year’s interior trends. With that in mind, we’ve rounded up the key interior trends predicted for 2017 and how you can channel them in your own home. Zest is best You heard it – green is set to dominate colour palettes this year and utilising the natural shade can help create an energising space. Whether you use accent bursts or go emerald with your paint palettes, introducing green hues into your home will be a sure winner this year. As one of the most soothing shades around, green can add a sense of ease to any part of your home. You might not want to use green from floors to walls, but introducing the colour subtly with accessories is a great way to inject the trend into your home. For refreshing green wallpaper ideas, discover the colours collection on our website. Fashion season is back in full swing, and we’ve seen a shift in silhouettes and a palpable shakeup in patterns and colour. From contemporary catwalks at Fashion Week, fresh into the walls and accessories of your home – here we explore how you can use these trends to help inspire a fashion-led switch up in your home. Texture touches Radical ruffles adorned the catwalk at New York Fashion Week, and channelling notably ruched décor is the best way to get the look. Add in frilly cushions and chiffon curtains to channel a romanticised style to your space. These kind of fabrics work really well alongside pastel hues and blushed metallic shades of rose gold and copper. The eyes of the world are on Rio de Janeiro as the Brazilian city steps up to host the 2016 games. There’s hardly a better time to take a slice of the country’s renowned carnival atmosphere and incorporate it into our interior design. From tropical wallpaper canvas prints and bold up-scaled geometrics to natural materials like jute, bamboo and wicker, we look at how you can take your interior to the tropics with a few simple tweaks and additions: Go bold and beautifulTake the biggest wall in your living room or open-plan kitchen and make a tropical feature of it. The new AL Collection at Photowall, created by artists from around the world, beautifully blends luxurious palm leaves and vividly coloured flamboyant flowers, as well as Honduras parrots, for an exciting samba style. Turn up the heat and create a fun twist by adding parrot or flamingo ornaments to the room. As a key decorating trend this year, creating a gallery wall can bring a bolder look into your interior. Splashes of timeless design perfectly combined with the interior trends of the moment, and making space for art can give your home a dash of excitement. Showcase your personal style and channel a design style that complements your current décor themes.Here we explore how to create a gallery wall based on your home style and current interior trends.1) Find your styleBefore committing to a gallery wall, it’s important to determine what kind of layout and design style you like. Do you prefer a structured grid style where all the frames follow a particular layout? Or do you prefer a scattered style? It’s also worth considering what kind of interior design trends you find most appealing – if you’re a fan of the Nordic movement, then a grid style monochrome gallery wall might be for you.2) Earthy eclecticThis style is perfect for the adventurous outdoor types and is loosely related to the 70s interior design resurgence. This interior style features botanical greens and dark wood elements with organic artwork. Wooden frames in a grid style work well to create a structured look that echoes the geometric patterns from 70s interior design. Warmer weather and longer days give you the opportunity to spend more time in the great outdoors. Long strolls in the evening sunshine accompanied by the occasional weekend coastal visits are beautiful, but there are more ways to get the summer feeling outdoors. You can recreate the feeling of your favourite summer pastimes from the comfort of your own home – as part of National Picnic Week, we’ve put together the best ideas to transform your garden into a space perfect for a spot of al fresco dining.Amp up the palettesThe art of repurposing and reclaiming palettes has become a huge garden trend over the last year, and as an extremely versatile material, palettes can be as multifunctional as they are decorative. Whether you want to create a base to house your herbs, or some plant boxes for displaying your beautiful flora and fauna, there’s a whole host of inspirational ideas to give new meaning to your palettes. For your next summery get-together, why not create a makeshift bar out of stacked palettes and stone slates. Pinterest is the best way to get tonnes of palette ideas for your garden.Use the huesAdd a splash of colour to your outdoor space to instantly brighten up your garden, and mix up the tones to create a scheme that works for you. Reflect your chosen indoor hues outside to keep a consistent flow throughout your home, or make a statement by adding contrasting colour pops to your plant pots and shed. Get creative with your paint, and add in some hand painted designs to breathe new life into your plant pots - you could even consider labelling your herb palettes to give a cute country chic feel to that area of your garden. Dark and moody palettes have long been associated with the gloominess of areas neglected by lighting, but one of this year’s top interior trends successfully dispels that myth. Dramatic dark tones were prevalent in interior trends last year, and now we’re seeing a shift towards moody hues and inky blues. Whether these murkier shades are used as part of a feature wall, or to cover an entire room, we’ve taken a look at how best to incorporate these swatches in your home for maximum interior impact.Blend the old and newOriginating from pantones prevalent in period properties, this trend allows you to introduce a touch of stately home into your interior. The inky trend gives you the perfect opportunity to blend the old and the new without redefining your home based around a particular period in time. Mix patterns such as stripes, which are a current trend in the fashion world, with inky blues and brass accents like photo frames, trinkets and lampshades to create a pleasant feeling of old and new, which blend together to create a modern, slick look inspired by olde-worlde home décor trends.Petrol hues & mysterious bluesShades of paint that evoke a sense of mystery, such as deep petrol hues, can create a dramatic effect in your space. The darker the hue, the more you have to try and consider how it will impact your room. Create a super-stylish living space by pairing dark, dramatic colours and beautiful bold feature accessories that will simultaneously lift the lightness of your room. Try channelling an alternative feature wall by using shelving to create a space for your photographs and artwork. Introducing a key blue piece can also add to the personality of a room – luxurious dark velvet sofas in your living room create a statement centrepiece for you to work around with different interior design styles. The wedding season is in full swing. 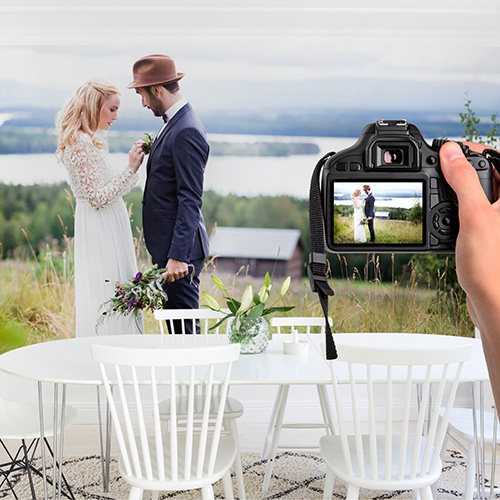 Here at the wallpaper factory, we decorate a wedding reception and talk wedding tips with Swedish blogger and bride-to-be Anja Forsnor. Wallpaper pennants in delightful designs, pastel wallpaper backgrounds and loving heart frills are some of our best decoration tips for the big day. Blogger Anja and her fiancé Marcus remind us not to neglect the small details, and to surprise the guests with something unexpected. Check out our wedding photos and read Anja’s and Marcus’s thoughts in the run-up to their big day for more wedding inspiration. It’s official: the Cannes Film Festival 2016 has arrived and the red carpet glamour is in full swing. But even with all the glitz of the beautifully sculpted hairstyles and killer outfits, nothing can overshadow the cinematic celebrations at an international level. Ever since its creation, the festival has been a proud supporter of the creative brilliance behind the big screen – from the biggest Hollywood stars to the backstage runners, every inch of Cannes festival is magical. Just imagine if you could recreate this at home…Here we explore how to get the Cannes Film Festival feeling in your home all year round:Saint JoanIconic scenes from classic films can provide the perfect backdrop to your home and make a bold statement about your style. Hollywood starlet Jean Seberg made her debut appearance in the 1950s classic Saint Joan playing the heroine of France, Joan of Arc. The Photowall Joan of Arc wallpaper looks suitably fabulous in a French boudoir style interior. Contrast the stark black and white photograph with soft pastel hues typical of French interior design. This month marks the release of Alice Through the Looking Glass, giving us a welcome reminder of the beauty behind our most-loved children’s books. With its memorable characters and ultra-creative plot, the famous Alice in Wonderland tale is cherished as one of the greatest pieces of literature ever written.From fantasy to non-fiction, here we explore ways to get some Alice in Wonderland-inspired interior ideas in your home just in time for the next release on the 27th May.Whimsical wallpaperOne of the most famous chapters from Alice’s Adventures in Wonderland, is the one in which all the characters are crazily charmed at the Mad Hatter’s tea party. While you might not be planning such an illustrious extravaganza for your home, you can take inspiration from these key moments in the novel and use it to your interior design advantage. Channel the tea party theme in your kitchen or dining room to give a vintage feel. Floral, romantic patterns with forest elements exude the Mad Hatter’s tea party theme, so accompany this with distressed wooden home accessories to emulate a woodland setting. Photowall’s A Warm Summer’s Day is perfect as a wall mural or wallpaper.